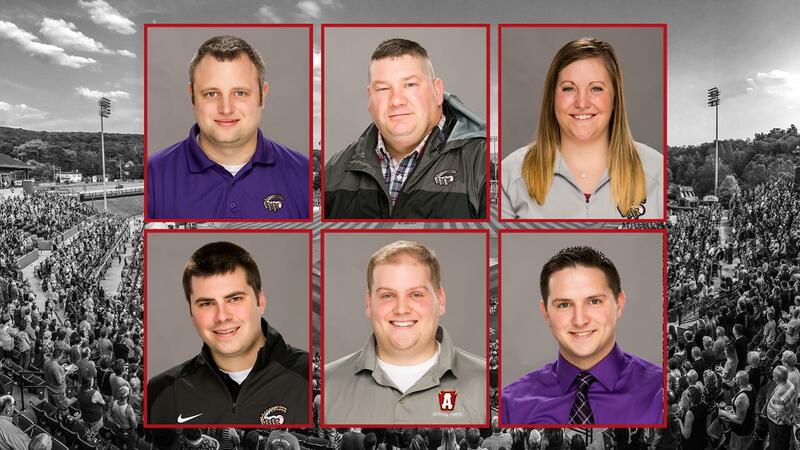 CURVE, Pa. - The Altoona Curve, Double-A affiliate of the Pittsburgh Pirates, announced six front office staff promotions and two new hires on Tuesday ahead of the 2019 baseball season. Nathan Bowen has been promoted to Assistant General Manager. Since joining the Curve in 2013, Bowen has held various roles throughout the organization in the ticketing and communications departments, most recently as the Director of Ticketing. A native of Fremont, Ohio and alumnus of Baldwin-Wallace College, Bowen is entering his tenth overall season working in minor league baseball, spending previous stops with the Durham Bulls, Northwest Arkansas Naturals and Princeton Rays. "Nate has excelled in each role he has held for us," Curve general manager Derek Martin said. "He has a lot of experience in the baseball industry and I am lucky to have him by my side to assist me with the daily operations." Corey Homan is now the Curve's Director of Business Development and Sponsorship. The Centre Hall, Pa. native and Penn State alumnus is entering his 11th season as a member of the Curve front office and his 15th overall in minor league baseball. Along with previous roles in the ticketing department, Homan was most recently the Curve's Director of Corporate Partnerships.
" I am excited to see what Homie brings to the organization in his new role," Martin said. "Corey has a lot of baseball experience and has been a recognizable face for us in Altoona for 11 years. He truly has a passion for what he does." Jess Knott moves into the role of Director of Ticketing after spending the last two years as the Curve's Box Office Manager. A hometown Altoona native and Penn State alumna, Knott joined the Curve staff as an intern in 2014, working her way through various positions in the ticketing department. "Jess has been a shining star for us and is one of the rising stars for women in the industry," Martin said. "I am proud of her for everything she has accomplished. She has a great work ethic and is going to be an exciting year for her." Joel Fox advances to the title of Box Office Manager after spending the previous two seasons as a Ticket Sales Manager. A native of Clearfield, Pa. and alumnus of Penn State, Fox joined the Curve in 2017 after spending one season with the State College Spikes and a stint working in the banking industry. "Foxy is very organized and knows our ticket system well," Martin said. "That is important to us as a Box Office Manager. Joel will fit into his new role very well." Ed Moffett is now a Senior Ticket Sales Manager for the Curve after holding the title of Ticket Sales Manager for the last two years. The Bernville, Pa. native is a Penn State alumnus and spent three seasons with the Reading Fightin Phils before joining the Altoona front office in 2016, and he is entering his sixth year overall in minor league baseball. "The Moffett Man has a great outgoing personality that our fans really enjoy," Martin said. "Ed is going to head up all of our theme nights to bring in more groups in 2019 and hearing his ideas already, it is going to be a fun year." Garett Mansfield has been promoted to Director of Communications & Broadcasting after spending the 2018 season as the team's Communications & Broadcasting Assistant, and he will take over as the team's lead play-by-play broadcaster. A native of Defiance, Ohio, Mansfield is a graduate of Bowling Green State University and spent time with the El Paso Chihuahuas and Beloit Snappers before joining the Curve earlier this year. Mansfield takes over for Trey Wilson, who spent the last four seasons as the Director of Communications & Broadcasting and play-by-play broadcaster. Wilson is leaving the Curve to join the Richmond Flying Squirrels in a similar role. "Garett is a great young professional that brings a lot of experience with him," Martin said. "Trey will be a hard one to replace but I feel Garett will fill his shoes well. "We wish Trey the best of luck in this new chapter. It is great he gets to do what he loves back in his home state close to his family. He is going to a great group with Chuck Domino, Parney and Ben Rothrock, all who are good friends of mine, and we will still see Trey a few times a year." "The Curve are one of top organizations in the game of baseball, and the Altoona community has been a great place to call home," Wilson said. "I am excited for the opportunity to return to my home state, but I will always be thankful for my time in Altoona and the great people here. Curve fans are in good hands with Garett on the air and behind the scenes." Bryan Sowers joins the Curve as a Ticket Sales Manager after spending the 2018 season completing a box office internship with the club. A native of Keymar, Md., Sowers is a graduate of York College of Pennsylvania. Jeremy Snyder also moves into a full-time Ticket Sales Manager role after working as a box office intern the last two seasons. A Lock Haven University alumnus and native of Altoona, Snyder grew up attending Curve games at PNG Field and is excited to join the staff and create memorable experiences for fans. "We are happy to welcome Bryan and Jeremy to the Curve family," Martin said. "During their internships, they learned a lot and had a very strong work ethic. To be successful in this career, you need passion, a strong drive to succeed and the willingness to make a difference in the community and I believe we found that in Bryan and Jeremy." 2019 Curve Holiday Books, which include an exclusive Al Tuna Snowman ornament, are now available for a limited time. For tickets or more information, visit AltoonaCurve.com, call 877.99.CURVE or stop by the Peoples Natural Gas Field offices.